Hello, I can't believe that I am 99.5% complete (still have to complete the required label) with my very first stain glass quilt wall hanging. It turned out better than I expected. 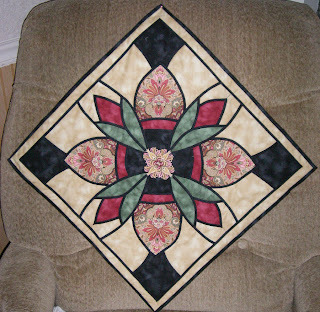 The only pain was quilting down the leading on both sides of the 1/4 inch black leading fabric. Second least favorite was passing all the loose ends to the back, tying them off and then hiding the ends. I had so many to do. From there, it was squaring up and binding time. Luckily I had just enough (only 3" to spare) of same black fabric available to create the binding and stitch it to the quilt. 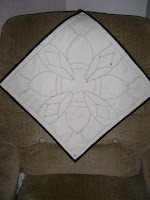 I hand finished the binding by turning and sewing it to the back of the wallhanging. Of course, there are multiple places of sewing "boo boos" on the back. But, hey, who's going to see. 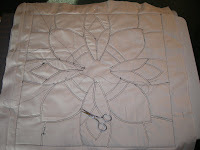 So here is a photo of the back of the wall hanging once the quilting, knotting, and binding the wallhanging.